Earlier in the day, it was mild with stratocumulus breaking into cumulus patches. Some cirrus developed from the NW indicating fairly strong upper level winds. Cumulus developed from the west on the mountains. 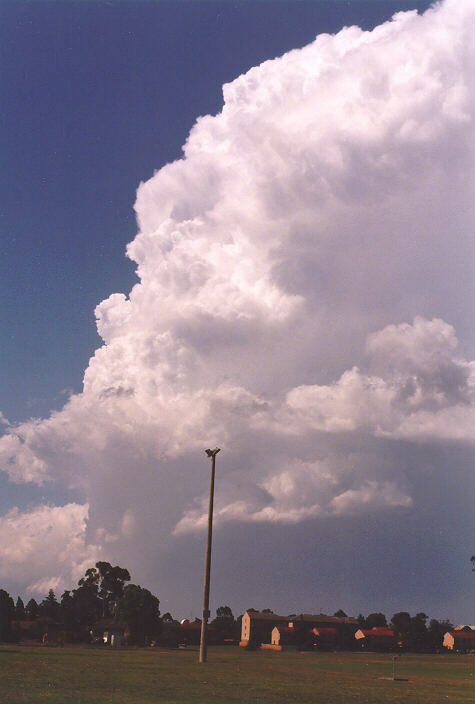 Altocumulus castellanus was also observed with cumulus developing from these. 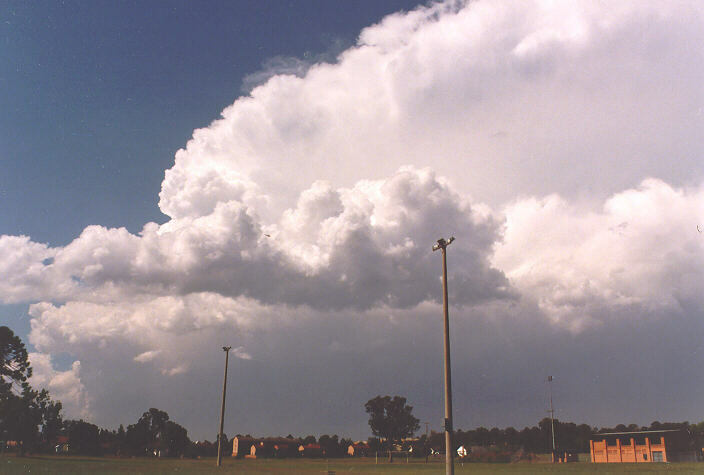 Larger cumulus developed with weak anvils during the early afternoon. Around 2:30pm, a dominant cumulus developed further into a thunderstorm to the south around the southwestern suburbs moving northeast. However, my attention focused on the cell developing to the west and southwest of St Marys. I was heading to Werrington for a game of squash. I basically ignored the large cumulus thinking it may take an hour or so to really develop further. It did not look organised. How wrong I was, within half an hour, heavy precipitation was already falling with a structure indicating hail. It was already too late to chase as the storm was multicellular and developing on the northern side. Its overall movement was northeast. The storm struck Werrington around 2:45pm with heavy rain lasting 15-20 minutes. 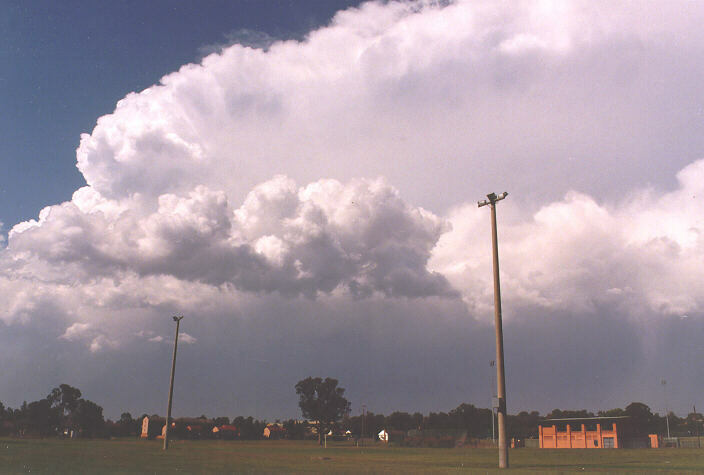 During this time, thunder was observed and became more frequent. By 3pm, it had intensified with mulitcellular development stretching towards Richmond and Windsor. It moved in an east to northeasterly direction. A spectacular back anvil had begun to develop around 3:30pm. I stopped to take a few photographs of this: the only consolation of what I had missed. Over the next few days, I began to receive reports from farmers that 'bad hail' had damaged crops in the region from Oakville to McGraths Hill. Then I recieved a report of hail the size of "ennis balls" falling in the Oakville area. However, it seems the hail is more likely to have been slightly smaller hail with measured diameters of 4-4.5cm in the Pittown area and also the Oakville region. These had been kept in the freezer and my friend measured them. Reports from the Oakville area seem to suggest larger hail with crops totally destroyed besides the lack of wind. On one particular farm, a cover normally used to protect fruit trees from hail had been installed over hydroponics containing various types of vegetables. The netting normally is at a height of 4 metres (17 feet) and due to the weight of the hail stretched down to just under a metre (3 feet). It stood up to the task and saved that crop. Other reports of damage were stripped trees, some cracked roof tiles, and obviously, dented cars. Other hail was reported from around the Richmond area (golf ball sized); a hail swathe through the Londonderry-Castlereagh area which probably continued on towards the Oakville area. Pea sized hail reported from Quakers Hill, Schofields, Riverstone and Box Hill. Hail was also reported at Epping from the earlier storm. 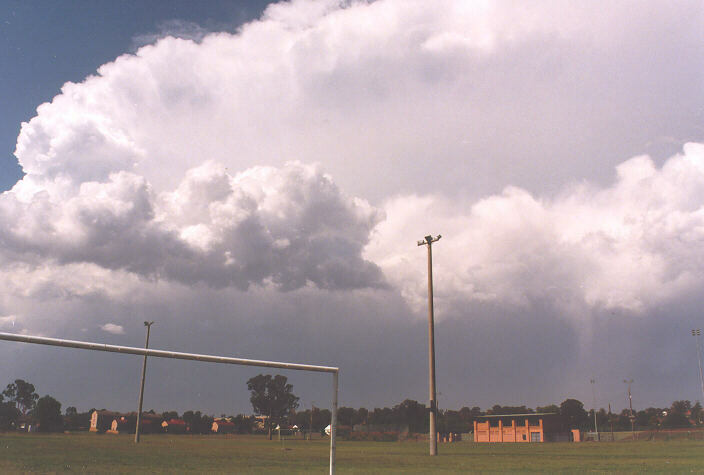 The storm system headed towards the Central coast where severe thunderstorm advices were issued during the late afternoon and evening. A pleasant SE change developed later.